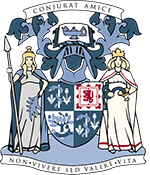 The Royal College of Physicians and Surgeons of Glasgow is now open to members of the public every Monday afternoon from 2 pm to 5 pm (excluding public holidays). Visitors can come and view John James Audubon’s Birds of America on display in the Library Reading Room, and see the latest temporary exhibition in Crush Hall. This month we are exhibiting some rare and treasured items relating to our College founder, Maister Peter Lowe (c1550-1610). These include a beautiful pair of early 17th century gloves reputed to have belonged to Peter Lowe; the first minute book of the Faculty dating from 1599; Peter Lowe’s book on “The Spanish Sickness” (syphilis); and a rare first edition of his work “The whole course of chirurgerie” – the first book on general surgery to be printed in English. Peter Lowe, Whole course of chirurgerie. London: Thomas Purfoot, 1597. This first edition has been extensively restored but is still quite fragile. 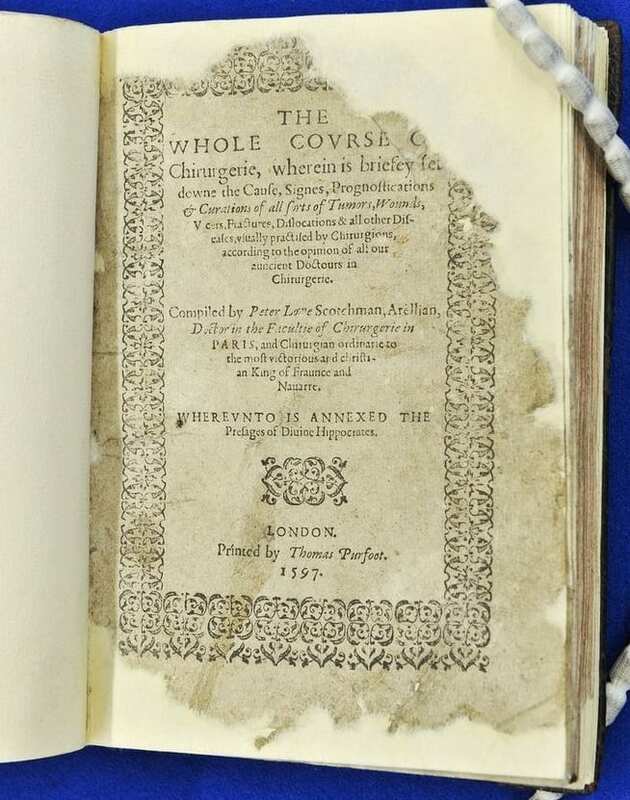 Published in 1597, “The whole course of chirurgerie” takes the form of a dialogue between a teacher (John Cointret) and his pupil (Peter Lowe) and covers five different classes of operation. The first is to take away that which is hurtful e.g. tumours; the second concerns artificial limbs, eyes etc; the third is to put in the natural place that which is out of place (hernias, dislocations etc); the fourth part discusses operations to separate and includes guidance on circumcision and separating conjoined fingers; and the fifth part discusses broken bones. 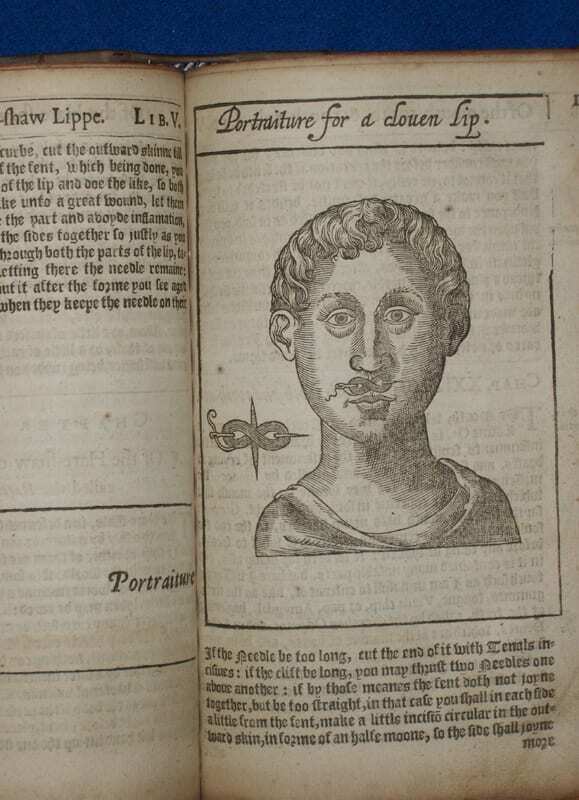 Unlike subsequent editions of the book the first edition does not contain any illustrations, these were added in after the death of Peter Lowe in 1610. 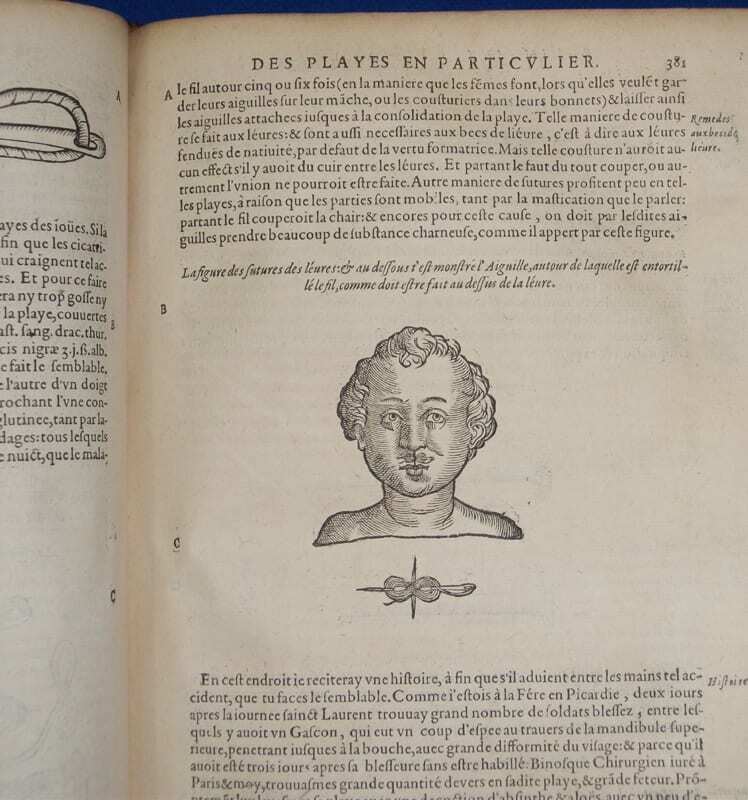 Many of the illustrations used in later editions of “The Whole Course of Chirurgerie” appear to be copies or mirror images taken directly from a work by French surgeon Ambroise Paré (c1510-1590). It is not only in the illustration of Lowe’s book that the influence of Paré can be seen – many of Lowe’s recommended dressings bear a similarity to those in Paré’s “Collected Works”. Did Peter Lowe know Ambroise Paré? The two were contemporaries and Lowe studied and worked in Paris so it is probable that they met. The “whole course of chirurgerie” is dedicated to King James VI of Scotland and I of England who granted our charter in 1599. The Peter Lowe exhibition will be on display in Crush Hall on the 23rd September and 7th and 14th October 2013 (Please note: the College will not be open on 30 September 2013) – All are welcome!